Popularly known as twin city of Hyderabad, Secunderabad has its own history, culture and commercial elements. Being under British cantonment before independence, the areas in the Secunderabad map provided here are seen to be more influenced by the western culture than the Hyderabad. Today Secunderabad is considered as a part of Hyderabad city and is administered under GHMC. Though the areas in the map here enjoy equal developments along with Hyderabad, the contribution they give back to the Hyderabad city is also as significant. Together, Hyderabad and Secunderabad form the 5th largest metropolis in India. 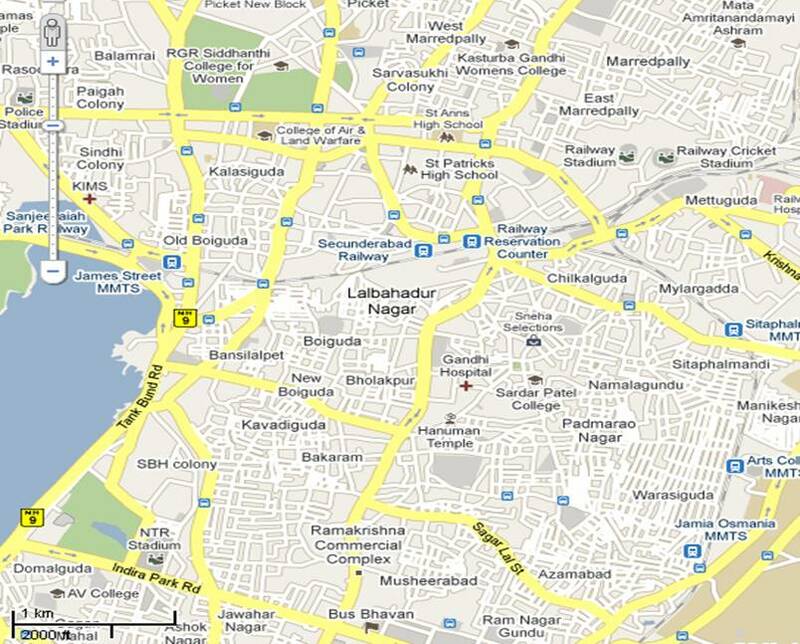 This Secunderabad Central map majorly covers only the civilian areas or the township of the Secunderabad cantonment. Secunderabad was the area allocated to British military base, from the Hyderabad state, under the policy of subsidiary alliance. The name comes from Sikander Jah, the Nizam of Hyderabad state, when British cantonment was established in Hyderabad. Secunderabad is separated from Hyderabad city by the Hussain sagar. Trade in Secunderabad became more profitable than in Hyderabad, as the imported consumer goods were exempted from the customs duty. James street circle was the famous shopping place, followed by other famous markets like Regimental Bazaar, General Bazaar, etc. The 1857 sepoy mutiny forced British forces to construct a mud fort and a 17-feet high wall, called as Entrenchment, which exists even today in Trimulgherry. The King Edward Memorial Hospital – now Gandhi Hospital – was established in 1851. The Secunderabad Railway Station, constructed in 1874, is one of the largest railway stations in India. Salar Jung, the then Nawab of Hyderabad, gifted his country house to British in 1878, for Secunderabad club. The club today is one of the top 5 clubs in India. Sir Ronald Ross, who is well known for his Noble Prize for isolating malaria virus, has actually conducted his experiments from Secunderabad. Secunderabad, one of the largest cantonments of India, grew into a replica of an English town under British rule. It got merged with Hyderabad municipality in 1964. The areas which are still under the jurisdiction of Secunderabad Cantonment Board are not given in this map. The Rashtrapati Nilayam, constructed in 1860 for British Residency House, is the office of President of India during his visits to South India. The Trimulgherry fort (constructed in 1857 after sepoy mutiny), Trinity church, Victorian Prison, the Clock tower are major monuments of Secunderabad. Of course, the Sec’bad railway station itself is the famous monument and landmark of the city. Secunderabad used to be more cosmopolitan compared to Hyderabad. It shares equal importance to mosques and churches, as it does with temples. Few of the popular or historic ones are St. John the Baptist Church, St. Mary’s Church, All Saints Church, Sri Ujjaini Mahankali Temple, ISKCON temple, Tadbund Hanuman temple, etc. Secunderabad is also hub of many places for recreation and sports. Few of them are Gymkhana Ground, Parade ground, Bollarum and Railway golf courses, Shamirpet lake, etc. Secunderabad is the hub for many of the city’s best schools and colleges. Prolonged British rule left Secunderabad with many christian missionary convent schools like St. Ann’s, St. Patricks, St. Andrews, etc., The area is also known for good colleges like Kasturba Gandhi Women’s college. There are many other good institutes in the non-central part of the Secunderabad. The former James street is now the famous MG road and still one of the major commercial places of the city. Park lane and Patny are known for hosting major businesses of fashion textiles, ready-made stores, jewelry stores, etc. The CTC is the major computer sales and services hub of the city. SP Road is known for businesses selling Hyderabad pearls; and Sarojini Devi Road for cinemas halls and hotels. If Hyderabad is known for Biryani, then the Paradise restaurant, located here, is known for Hyderabadi Biryani. Alpha hotel (opposite Sec’bad railway station), Blue sea hotel, etc., are few other famous hotels in Secunderabad. However, you can find many other hotels ranging from a chat bhandar like Emerald Chat Bhandar to 3-star hotels like Hotel Basera, Asrani, Greenpark, etc., in Secunderabad. This entry was posted on Mar 2010 at 1:53 PM	and is filed under Hyderabad Maps. You can follow any responses to this entry through the RSS 2.0 feed. Your Feedback Matters!